The Little Feminist is a children’s book and activity subscription box that focuses on diversity and gender equality. “The Little Feminist started because, now more than ever, children of all genders and backgrounds must believe in their dreams. But if our kids don’t see heroes that look like them, it’s going to be hard for them to believe their dreams really are possible.” says Founder Brittany Murlas. The Little Feminist, a children’s book and activity subscription that focuses on diversity and gender equality, launches for pre-sales today. “The Little Feminist started because, now more than ever, children of all genders and backgrounds must believe in their dreams. But if our kids don’t see heroes that look like them, it’s going to be hard for them to believe their dreams really are possible.” says Founder Brittany Murlas, who left her job as CMO of BabyList.com to start the company. Of the children’s books published each year, just 31% have female central characters, and in the last 5 years only 13% of children’s books feature a person of color. “Finding children’s books that feature a strong female or person of color is really hard, finding great stories among them is even harder. We do months of research so parents can take a break,” says Murlas. Three and six month subscriptions are available for purchase at thelittlefeminist.com, and the first book box will ship in February. For those gifting a subscription, The Little Feminist offers a pop-out activity gift certificate that will arrive in time for the holidays. The Little Feminist is a children’s book and activity subscription box that focuses on diversity and gender equality, teaching 3-7-year-old girls and boys (yes, boys can be feminists too!) empathy and perseverance. Books-of-the-month are selected by a team of educators, librarians, and parents, who then create a suite of hands-on activities to accompany each book. 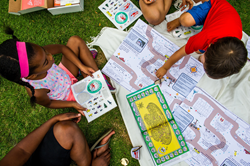 Whether it’s treasure hunts or DIY musical instruments, the goal of the included activities is to make the stories come alive for both children and families. The Little Feminist boxes are $35, and shipping is free.